Yesterday, we took a long drive down through the Palouse, a farming region south of our home. We drove to Uniontown WA, where the Dahmen Barn holds court for artists of many mediums. The talent ranges from stunning watercolors, photography, jewelry and fiber arts, pottery and other forms of delightful art. I love this barn, lovingly restored to its beauty from days gone by. 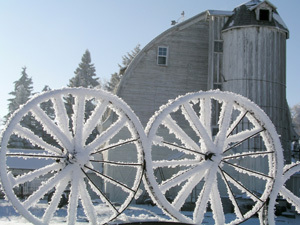 These frosty wheels are just a couple of many sizes and types that make up the fence along the barn. the inside of the barn has three floors. You can visit a visiting artist in residence, take a class or simply spend your time enjoying the art as my husband and I like to do. There are tourists visiting with cameras, photography clubs taking advantage of many views to capture and art students who enjoy being able to express their view of this Palouse treasure. I bought a lovely pair of handcrafted earrings, made by a local artist. I also purchased a bag of Joseph's Grainery Multigrain Pancake Mix at the barn. This is a family business spanning five generations over 70 years near Colfax WA. in the heart of the region. This is a close to the farmer as you can get for whole grain goodness. My family loves these pancakes, especially gathered around the big table at the cabin. Whether with huckleberry or pure maple syrup, these have become a tradition! What a lovely trip it was and we were back for dinner and the comfort of our own home. I love our area, so close to nature, so close to traditions that are a big part of the western part of the country. There are so many ways to connect on the web. Does anyone use Google+ or Stumble Upon? On any given day, especially in January, we are bombarded with commercials and magazine ads on diet, exercise touting the best way to lose weight. I have shared in the past my desire to get back to a healthier weight. I have not done that yet. There! I said it out loud. I have this weight that keeps hanging on like a clingy friend who won't let loose. That said, I have made progress. I think one piece that is missing from many of our weight loss goals is learning how to eat and what to eat. Good whole foods are the best. I know some of you may think that is an expensive option. Take a trip around the grocery store and compare foods and prices. Look at serving sizes, nutrition and how many how many items on the label that you can't pronounce. What is this unpronounceable ingredient? Will it make it taste better, look better or last longer? Enough said. I follow a blog called Musings of a Housewife and today her post about Food Safety VS Nourishment inspires me to push myself to challenge myself to really get off my duff and look in the pantry. I'll weigh in next week to check my progress not only on the scale but also how well I feel. Check out my new photostream on Flickr! Creating a space for my sewing really paid when I look back at the projects I created within the past 6 months. Doll clothes, aprons, bags and more. It was a challenge to get the room set up and it is constantly evolving. My mind is often racing with ideas and the next thing I will invest in is a drawing pad to jot these ideas I dream up in the course of the day. I can't wait to see what happens in the next 6 months and I hope you will share your feedback on my projects. I participate in an online sewing group, Sew Much Talent...where we share ideas, projects and pictures of things we are making. One of our recent discussions is whether we believe that sewing is a lost art...and have all had varying thoughts we've shared with one another. Do you think Sewing is a lost art? The morning is dark, the sun has yet to rise. I look forward to this fresh day with no mistakes so far. Morning brings so many possibilities for the day. My mental list is so full yet when I look back at night sometimes that list so full of purpose in the morning seems to have vanished with the thousands of other thoughts I have during the day. Today, I am going to write down my mental to do list and tonight I am going to review it to see if I made the most of this wonderful Tuesday...the only Tuesday I get this week. After experiencing a lengthy job search I am listening to a small voice that has been telling me to use my sewing talents to create doll clothes that will delight little girls in their imaginary world of play. 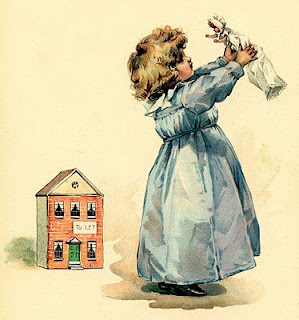 I am opening a new chapter in my life to create fashions for dolls and little girls. I am also going to create lovely pillows, accessories and gift items. I am also teaching private sewing lessons to young teen girls. Perhaps this is what I’m meant to do after all. In this economy jobs are scarce and by keeping myself busy with my sewing, watching my grandchildren grow and volunteering. I have a rich life, one that I am so blessed to be living. Perhaps at the right time, a wonderful job will present itself, or so my sister tells me. For now I’m sorting my fabric stash, organizing my cluttered sewing space and determining the possibilities each piece of fabric possesses. The tree is down...what next? The tree is down, making The season officially over in our house because the tree is down. The kittens are approaching a year old now but they are still pretty mischievous. Every where we turned, Emma was underfoot taking a last bat at her favorites before they were gone for good. Ginger Joe sat in the background observing....until the vacuum came out. He couldn't get outside soon enough.Now that I have the vacuuming done I have a fresh outlook on our decorating. New furniture is not on my agenda but new pillows would definitely give the living room a new look with little more than the cost of my time. I have a vast stash with numerous options! Remnants purchased with pillows in mind. Often when I am searching for just the right piece of fabric I can't find it. Nowadays I scour remnant bins for large pieces that are marked down at least 50%. My inspiration is also sparked by trips downtown to Macy's or the Pottery Barn. This week while I clean up the sewing room I will take a look at what I have and get busy planning. I also have an abundance of trim, cording and other notions to have a lot of fun with this. Does anyone else feel inspired to perk up the house when the decorations are down?